The West Seneca Rotary Club and Shred-it are teaming up to bring shredding services to West Seneca and Western New York community on April 21 from 9 a.m. to noon. The event will be held at Dunn Tire located at 2150 Union Road in West Seneca. A lot of paperwork contains data and information that is considered sensitive. Account data, expense receipts and personnel files are especially sensitive and if any of this is taken it can lead to serious problems with identity theft. Identity theft can cost individuals and businesses thousands of dollars. Items brought in are shredded while you watch. This not only ensures that all of the information on your paperwork is securely destroyed but it means that the paper will be taken away for recycling once it has been shredded. The cost is $10 per banker-style box. There are no limits on the number of boxes that you can bring to be shredded. 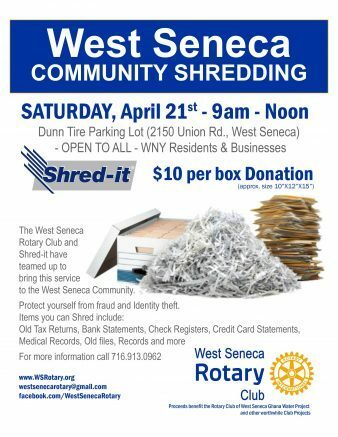 West Seneca Rotarians will be on hand to help carry items to be shredded. Be the first to comment on "West Seneca Rotary Club plans shredding event"